Irkut has demonstrated Yak-130 trainer aircraft fitted with laser rangefinder intended for visual identification of ground and surface targets and measurement of slant range to them at the MAKS-2015. 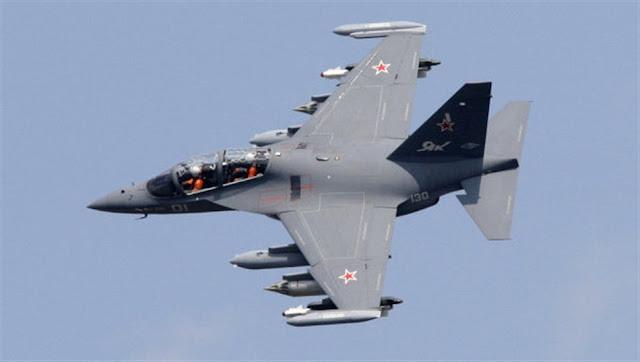 Russia has upgraded the the Yak-130 (tail number 01)in a bid to showcase it as not just a trainer but also as a light attack aircraft to its foreign customers. According to a press statement on Aug 28, the presence of the laser range finder allows for combat use of the Yak-130 in difficult terrain (mountains, gorges), improve the accuracy of determining the coordinates of the operational objectives and the application of existing nomenclature aircraft weapons.